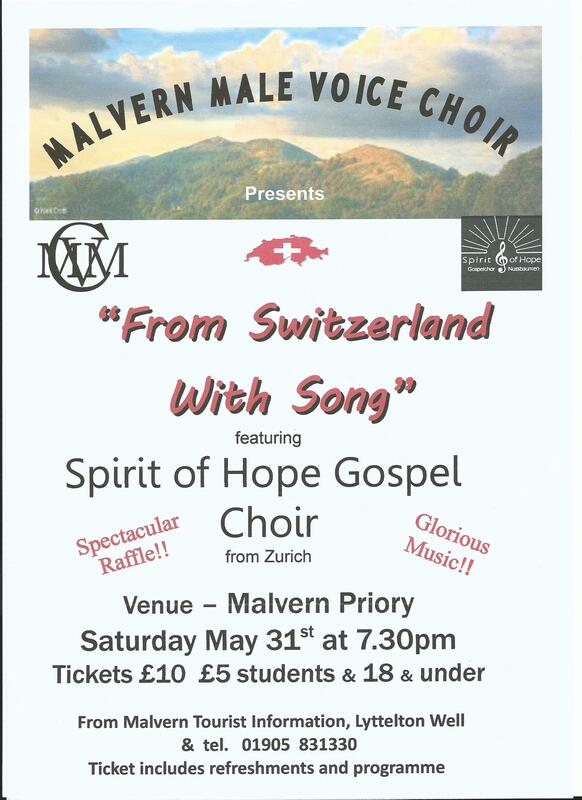 Malvern Male Voice Choir are hosting a joint concert with the Zurich based choir ‘Spirit of Hope’ in Malvern Priory on the 31stMay. The Choir from Switzerland is a mixed gospel choir of over 40 voices who are making this special trip to England to sing with Malvern Male Voice Choir. The Spirit of Hope Choir will be spending a long weekend in Malvern, combining shopping with sightseeing and, of course, singing in this Saturday evening gala concert in Malvern Priory. This once in a lifetime opportunity will be the climax of the Swiss Choir’s visit. The Spirit of Hope Choir aims to take its audience on a voyage of music with emotions in every song through ‘groove, soul and hallelujah’! Its Musical Director said, “We aim to give happiness and hope into the hearts of our listeners”. As a special treat for the Swiss visitors and the English audience, the trumpeter Charlotte Ellis will be making a guest appearance. Both choirs will be performing a varied selection from the best of their repertoires, they will sing together for some songs and, at the request of the guest choir, there will be a little Elgar. During the short interval there will be time for a drink and the grand raffle will be drawn. First prize will be two night’s accommodation in the Abbey Hotel chain. Other prizes are being donated by local businesses and there will be prizes from Switzerland too. The concert is at Malvern Priory, Malvern, on Saturday 31st May and starts at 7.30pm. Tickets cost £10 (under 18’s – £5), include a programme and a drink, and can be purchased in advance from Malvern Tourist Information, Lyttelton Well or by telephoning 01905 831330. If there are any tickets remaining, they can be purchased on the door.